Naperville Traders Estate Sales has been providing professional Estate Sale Services to our clients for over sixteen years. Naperville Traders offers the full liquidation of an estate, including automobiles, boats or camping vehicles. We are fully qualified to interact with realtors, attorneys, executors or the Court. In addition, we offer optional services such as post sale Internet or eBay consignments for items that require a more global audience, and for a small additional fee we will arrange for the boxing up, removal and disposal of leftover items to a charity of choice and/or a liquidator. We like to remind customers that before you part with or donate anything, including tossing what you perceive as junk, give us a call. In the case of antiques and collectibles, please contact us before you speak with an antiques dealer, as these are the items that will generate interest and pull people into your sale. Dealers will pay a fraction of what an item is worth because they need to cover their building, staff and other overhead costs. Be very wary of a firm that wants to buy your estate contents outright, as generally they will offer you only pennies on the dollar for a buy out. 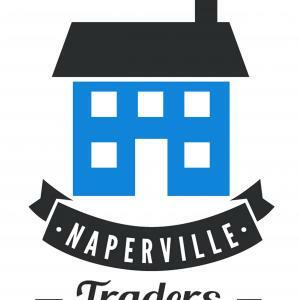 Typically Naperville Traders conducts two to four day estate sales, allowing more time for larger estates. While our name suggests that we do business in Naperville, Illinois, we do provide estate services for the entire Chicago Metropolitan area. We do virtually everything for you – we organize your items, set up the entire contents of your home in an attractive, buyer-friendly display. We price each and every item with research-based integrity, and our realistic and fair prices generate maximum revenue for the estate and the customer. We will advertise and market your sale on our email blast to over 5,000 customers, numerous media forms, various on-line venues that include substantial photographs of your items on our website, and countless directional signs. Naperville Traders Sugar Grove Sale 50% off Sunday & Blow-Out Sale on Tuesday! HIGH HIGH-END Estate Sale in Naperville - Bonnema Woods! Fun Wheaton Sale Starts Saturday by Naperville Traders! The Mother Lode of Vintage! Naperville Traders Sale Starts Friday 3/22! Naperville Bonnema Woods Part II -- Blowout Saturday Only! High-End Naperville Bonnema Woods Estate Sale Starts Saturday! Downtown Naperville Estate Sale Starts Saturday! Vintage-Antique-Deco-Awesome! Estate Sale in Montgomery Starts Friday! 1000+ Albums & DJ Equipment! Naperville North Side Estate Sale Starts Saturday! Doubleheader! Naperville Upscale Scott's Crossing Sale Starts Saturday 1/16! White Eagle (Naperville) Estate Moving Sale Starts Saturday! FABULOUS Estate Sale Starts Friday in Sugar Grove-Huge Painted Lady Home! Filled to the Brim! Huge Estate Sale in Brookfield--Tons of Sports Memorabilia! One Day Blow-Out Sale in Naperville! 75% Off on Most Everything! Naperville Old-Fashioned Estate Sale-Fun, Like They Used to Be!! Lisle Estate Sale Starts Saturday! John Deere Lawn Tractor, More!! Double Header Weekend! Naperville Stillwater Sale Starts Saturday! Fab Estate Sale in Oswego Starts Saturday! Mind-Blowing Naperville Estate Sale Starts Saturday! High-End St. Charles Estate Sale Starts Sat., Oct. 6th! Marge Carson, Sports Memorabilia, More! Downtown Naperville Awesome Estate Sale! Starts Saturday! High-End White Eagle Sale in Naperville Starts Friday! FORE! Naperville Cress Creek Sale Starts Saturday! Sweet Sale in Lisle - Green Trails Starts Saturday! Phenomenal Plainfield Estate Sale & Man Cave Starts Saturday! Naperville North Side Estate Sale - Stickley, Pottery Barn +++ Starts Saturday! Estate Sale in Naperville's "Scott's Crossing" Starts Saturday! GINORMOUS Home on the River! Downtown Naperville High-End McMansion Estate Sale Starts Saturday! Jam-Packed Naperville Estate Sale Starts Saturday 6/16! Loaded! Second Sale in Naperville Double Header Weekend!! 5 min. apart! Naperville Double Header Estate Sales Start Saturday, June 9th! Antiques and More Estate Sale in Stonebridge Starts Saturday! The Go-To Sale in St. Charles Starts FRIDAY May 4th!! Double-Header Sale! Glen Ellyn Estate Sale Starts Saturday! High-End Naperville White Eagle Estate Sale Starts Friday, April 13th! Wheaton Estate Sale Starts Saturday April 7 - Near Cosley Zoo! Best Sale of the Weekend! Naperville Knoch Knolls Sale Starts Saturday! Estate Sale in Lagrange Starts Saturday! 65 Years of Stuff!! Naperville Estate Sale for Millennials and Everyone Else! Starts Saturday! Amazing Naperville Sale Starts Saturday! Estate Sale in Naperville's Cress Creek - on the Golf Course Starts Saturday! Terrific Higher-End Estate Sale in Bartlett Starts Saturday! Naperville Double-Header Weekend- Cress Creek Sale Starts Saturday! Naperville "Woods of River Mist" High-End Estate Moving Sale Starts Saturday! The "Go-To" Sale of the Week! Downers Grove PACKED-4 Generations of Treasures! High-End Lincoln Park Estate Sale-- One of a Kind Fabulous Things! This company has posted a total of 111 estate sales. Only the most recent 50 sales are shown.